Broome’s famous Cable Beach, named after the telegraph undersea cable that was laid in 1889 to enable communication with England via Singapore, stretches about 23 kilometres-14 miles. The first creek to the north is Willie Creek and we often visit it on the south side when we monitor the breeding pairs of Pied Oystercatchers. To access the northern side of the creek you have to drive inland some distance and depending on the tide take one of two tracks across the salt flats to reach the creek. 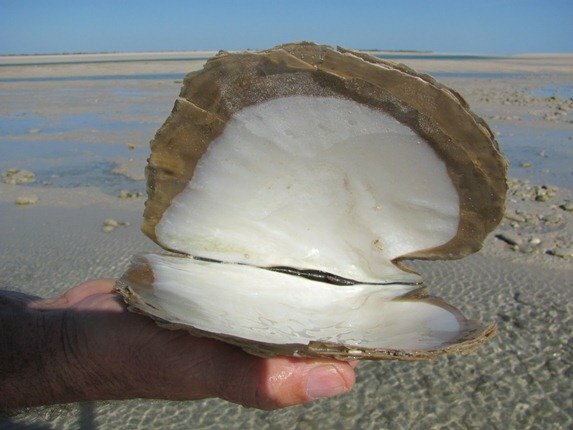 Most tourists that visit Broome take a tour of the Pearl Farm at the creek and learn about the cultivation of pearls that were Broome’s first industry. By 1898 Broome was the largest port in the north and continues to service both industry and tourism. 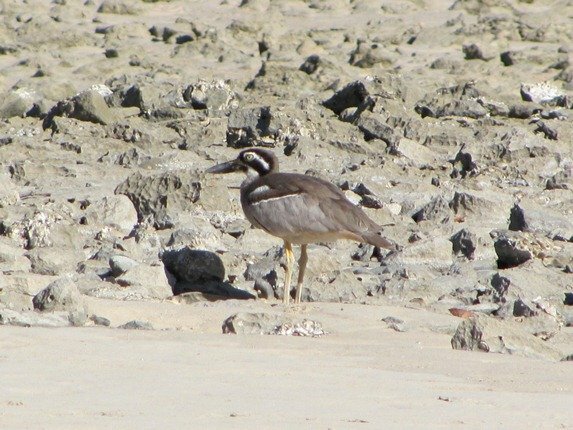 Our visit to Willie Creek was not to visit the Pearl Farm, but to go and see if our pair of Beach Stone-curlews were in their usual spot. 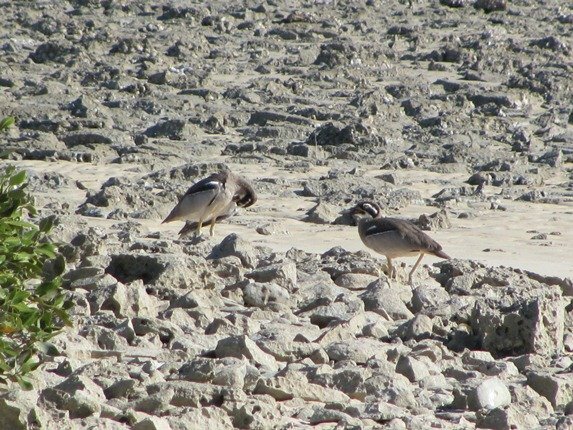 We had not seen any yet this year and inspired by the post on the Senegal Thick-knee we realised there was an opportunity to add one more bird to my year list! 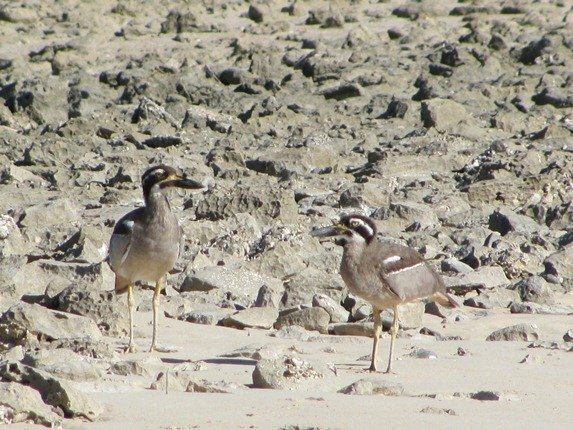 We have previously called these birds Beach Thick-knees, but as with so many species around the world in recent years they have had their names changed. We were the only people walking along the creek edge, which thankfully is steep and gave us some protection from the renowned “Willie Creek crocodile”. 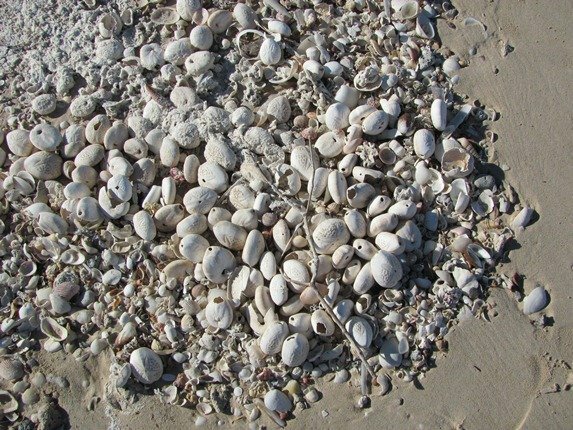 The tourists were safely in a boat exploring the history of pearling and the beach was ours to explore. We didn’t see the crocodile, but there was a Flatback Turtle in the creek. As we approached the spot where the pair of Beach Stone-curlews were seen in previous years we heard them call. They were exactly where they were last time-isn’t it nice when that happens! They were totally at ease with us as we slowly walked by and continued to preen. 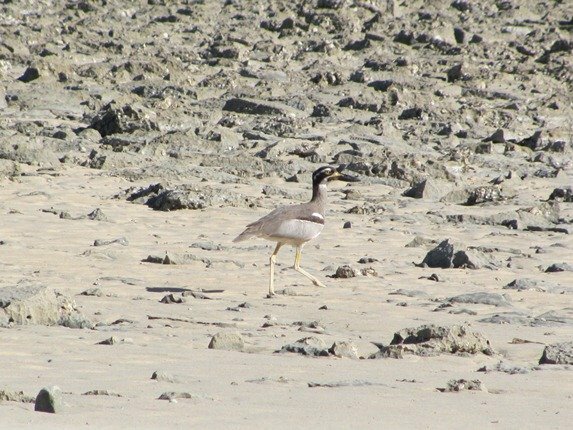 Although the majority of shorebirds have ventured north to breed in the northern hemisphere we do still have birds here. The birds that made their first trip to Broome last year are still present as are some older birds that have chosen not to make the long arduous trip this year. Although the numbers were almost down to individuals on some species we did see Whimbrel, Eastern Curlew, Greater Sand Plover, Terek Sandpiper, Grey-tailed Tattler, Red-necked Stint and Ruddy Turnstone. The resident Pied Oystercatchers were feeding on the mud as the tide continued to fall and the Brahminy Kites circled over the creek looking for fish. 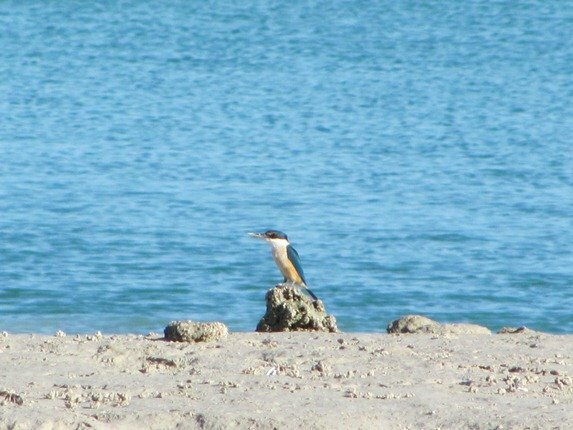 There were five Sacred Kingfishers flitting from rock to rock as we followed the creek. The edge of the creek as we got closer to the ocean was littered with pearl shells and we presume that these must have broken free during the cyclone season earlier in the year. There were some rather nice specimens. During the World War 1 the only use for the pearl shell was soldiers’ uniform buttons due to the decline in the European market and as you can see-there’s a lot of buttons in a shell this size! We followed the creek and the high tide mark was of particular interest. 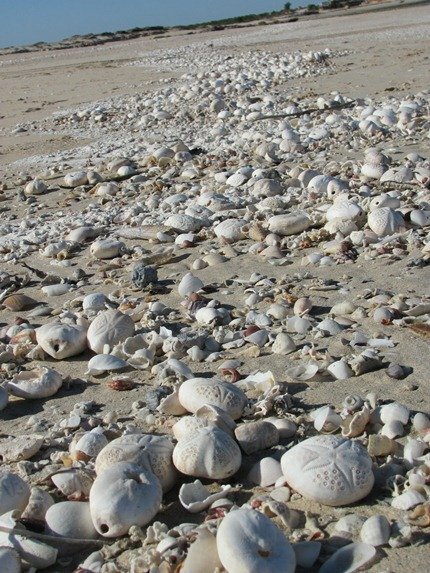 There had been literally hundreds of Sea Potatoes wash up on recent tides. We have had some strong winds in recent weeks and this may well have contributed to the considerable number. Willie Creek is a great place for a beach stroll on a falling tide and to see if you can see the crocodile! This week I observed a lone bird’s footprints between town and the port, so there may well be a search for a mate occurring right here right now! Beautiful post! The Beach Stone-curlews remind me of Raccoons with their striped faces. I love the stories you told and the colors of the animals, beach, and sea. “Willie Creek Crocodile” – finally, we see the return of deadly suspense in your posts. I guess you didn’t see the crocodile as it is still recovering from the brown snake bite it received recently? Wow!!! These birds on the beach are looking so fascinating. I visited Broome several years ago and I enjoyed a lot with Broome tours. Broome is a very beautiful place and I want to visit it once again.